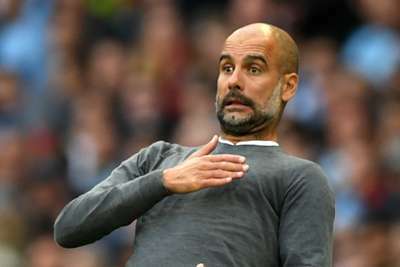 Pep Guardiola does not believe Manchester City are ready to win the Champions League title but said the team's fans can push the club towards glory in the competition. City have never reached the Champions League final and their supporters have an unusual lack of affinity to the tournament, booing the anthem and leaving swathes of empty seats for home games at the 55,000 capacity Etihad Stadium. Only 40,111 supporters attended City's loss at home to Lyon in their opening Group F fixture, which Guardiola had to watch from the stands as he was serving a touchline ban. Guardiola previously urged City fans to respect the Champions League anthem and he indicated supporters need to get on board to boost his team's chances of a maiden major European trophy. "I was born in Barcelona and grew up there. When I started the only way to survive is to win," two-time Champions League victor Guardiola told a news conference. "But I also learned when you don’t win life goes on and you have another chance. "What I saw in my team last season, honestly I think we are not ready. That's what I feel. That doesn't mean we won't try, but to win the competition it's not enough to want to win it. You have to have the experience. Every game we will learn. "You have to desire, the club, the chairman, the owner, the fans, the media. Everyone has to be in it. When that happens, to win this kind of title you have to be pushed from everybody surrounding Man City and still we don't have that feeling. "The fans push you to win the Champions League. When that happens you are closer. We are a good team, you can't deny that, but you need something special - we don't have that. "Maybe in the future. Sooner or later we will be closer every year. Hopefully as soon as possible." Guardiola is without Fabian Delph and Ilkay Gundogan but Kevin De Bruyne and Kyle Walker are available for Tuesday's trip to Shakhtar Donetsk, where City lost 2-1 in the group stage last season having already qualified. And the Catalan hailed centre-back Aymeric Laporte, who is yet to be capped by France, while urging two of his senior stars, David Silva and Fernandinho, to play on as long as possible. "Laporte sooner or later will be selected," Guardiola said. "It's difficult to find a better left central defender in the world. We never push them to retire or say no to their national teams. "It is what it is. We cannot deny that players who are 32, 33 - to have 10 days off is good for their minds - but the other side to play World Cups and European Cups is good for them. "They [Silva and Fernandinho] have two more years contract but they have to think day by day, month by month and then ask themselves at the end of the season if they are still ready to play. My advice then is to play, you have to play. "Fernandinho for every manager in the world, he helps to make them the luckiest managers in the world. Everything is respected in the team, he respects every day in training. He is open to improve. He is a joy and will always be a special person for me as a manager to work alongside him."